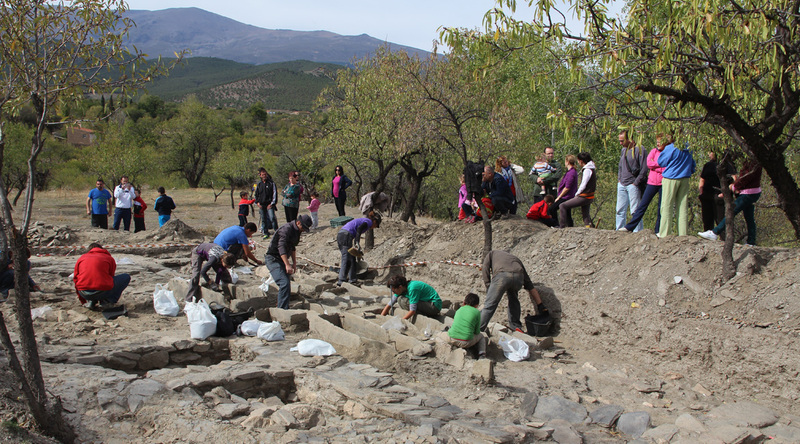 The archaeological excavation has been developed near the village of Lanteira (Granada), located in the Northern face of Sierra Nevada, opposite with respect to Cáñar, that is in the Southern face of the mountain range.The excavation took place in the area known as El Jarafí, an already documented medieval neighbourhood in Lanteira. It is in fact, a very interesting location, as there are three different archaeological Islamic sites, one of them containing a castle. Documents from the 16th century mention the castle, and the area around it, as the Jarafí neighbourhood of Lanteira. It is described that before the Jarafí, two other neighbourhood existed, named Benizahala and Benahaque; inhabited until the 12th century, when the Jarafí and its castle were founded. Both place names refer to the Arab tribes that arrived from Orient in the 8th century. Our hipothesis is that these two places correspond to the two remained archaeological sites identified. Both are very closed to one another, and the chronology of the superficial pottery corresponds to the period of the Arab conquest. In addition, key relevant structures for natural resources management were identified close to these two sites. These structures are the main irrigation system and some silos located on the surface that could provide relevant archaeobotanical data. 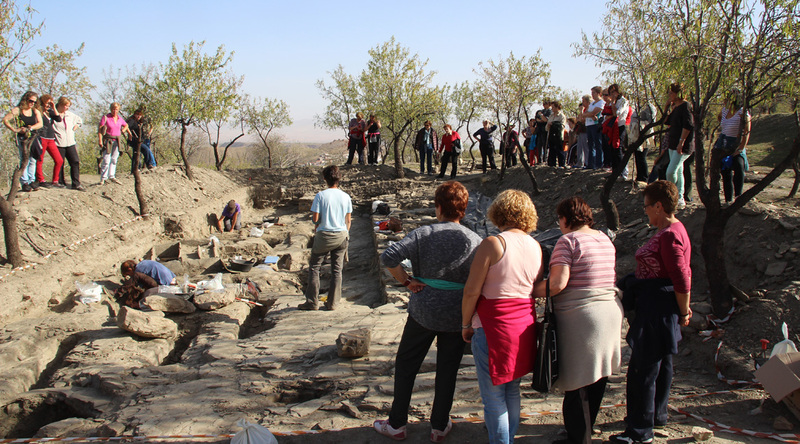 All these evidences, justified the implementation of the archaeological excavation in this area. Thus, the main goals for the campaign were: 1) To get more information in regards to settlement patterns during the Arab- Berber conquest 2) To obtain evidence that could explain the relationship between water management structures and historical landscape transformations. 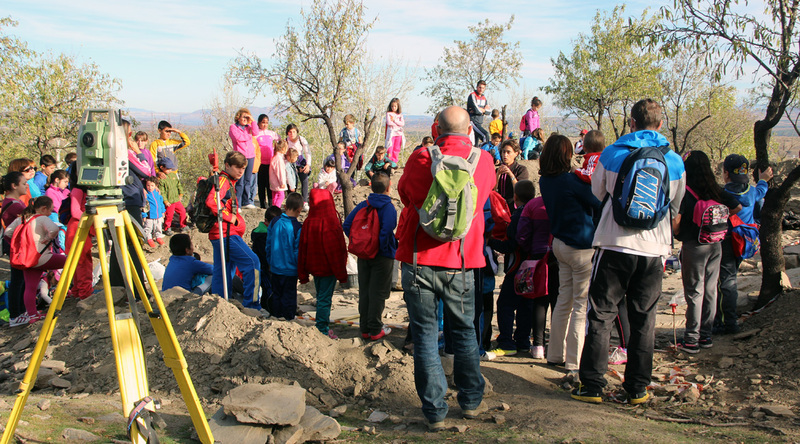 The excavation was planned for the month of July, with the idea of involving the student community of Universidad de Granada. However, administrative procedures and technical difficulties, derived from the geophysical survey, delayed the activity until September. We had planned to perform five sondages in different areas to test the stratigraphic sequence and excavate the silos. The geophysical analysis and the superficial features should have provided specific information about the excavation sites. Nevertheless, the agricultural activity developed in the area for centuries, and after the settlements were abandoned, disturbed the data and its interpretation, complicating the intervention. The first two sondages (10.000 and 20.000), with 5 per 5 meters each, gave no results. Three other sondages, with the same dimensions as the previous ones, were performed in a lower terrace, where the silos could be seen on the surface. The first sondage was done at 30.000, the second at 40.000, and the third one at 50.000, located 50 meters further to the South. This last sondage at 50.000 gave very little data; however we were able to document new silos partially destroyed in the medieval period by another structure excavated in the schist. The rock had been adapted and transformed, becoming part of a later structure. Some remains were found but still have not being interpreted. The sondages 30.000 and 40.000 turned out to be very fruitful and, at one point, both sites were joined in a single extensive area. We documented three significant elements and located them in an historical sequence from the 8th to the 12th century. The first element corresponded to four silos, three of them apparently sealed. The second element corresponds to a big house with three different phases. The third element is an Islamic cemetery with 22 tombs. 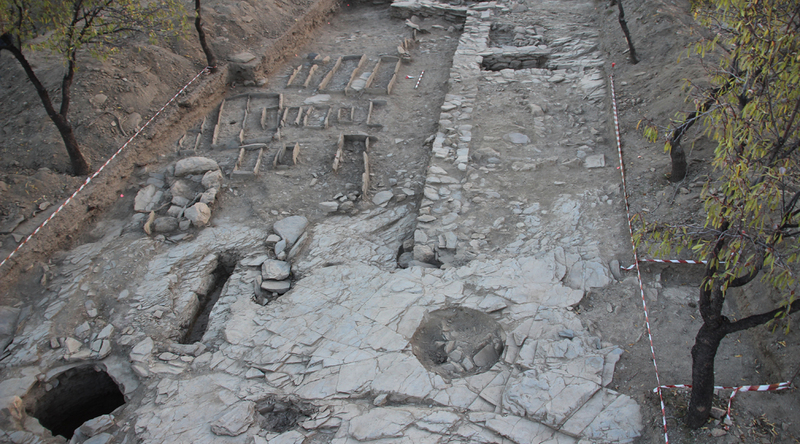 The silos and the tombs did not coincide in time, in fact we can affirm that the silos are from a previous time period, probably coexisting with one of the first phases of the house. Thus, the silos could have been abandoned when the area became a cemetery, although the house was still in use showing its last phase partially built over one of the silos. 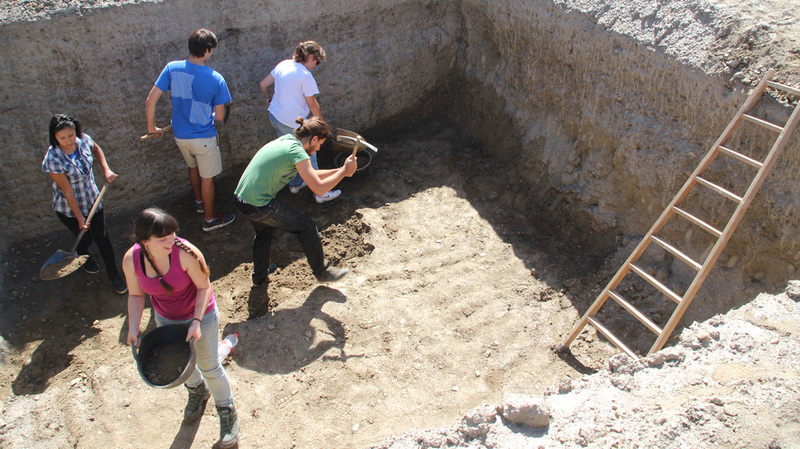 This excavation campaign has been a great success, allowing to gather a fair amount of features, which includes enough quantity of soil to be floated for archaeobotanical analysis. 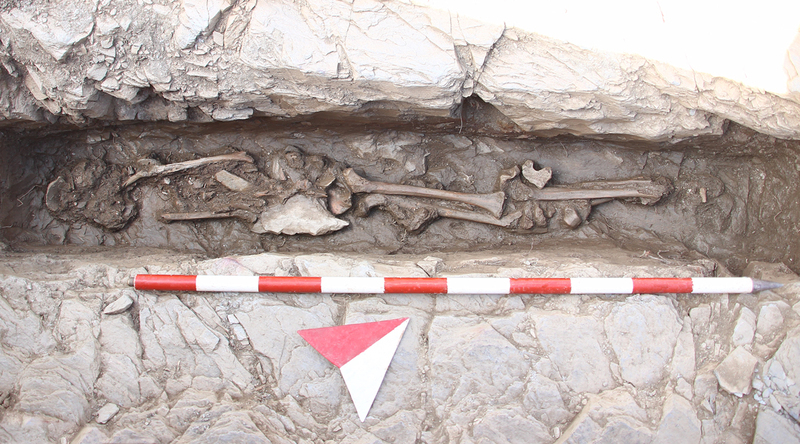 The cemetery was carefully excavated and we hope it can also give us information, not only in terms of chronology or in regards to population pathologies (i.e: most of the bodies were not adults), but also in regards to the settlers diet. Knowing what the medieval population ate can be extremely valuable information, since it could lead us to understand agricultural practices and therefore, landscape formations.